Absolutely dread going to your location wireless provider's store and having to be social? If it's one of your worst nightmares, hopefully this will help you change that. Guest post by a "connect" in the wireless industry. Buy at the end of the month or during bad weather. It's funny, but the best time to buy a phone is at the end of the month. Every store has a quota to hit and the sales reps are a lot more tempted to make a good deal if it's the end of the month. They'll most likely be offering better discounts to try and get those final sales for their quota. Also, on days when the weather is really bad, the store has probably been slow most of the day and the reps are bored. We're not kidding. They'll want to talk to you and want to sell you something. The sales reps have probably made nothing in terms of money for that day and they'll be eager to try and make a deal for you. Use them as a bargaining tool. This is a great way to get extra discounts or deals on a phone. Tell the rep you'll sign up for the data plan (if not already required based on the phone like a smartphone) plus insurance and other extra features if they'll cut you a small deal on the equipment. ARPU (Average Revenue Per Unit) is always a huge goal for managers and employees, and it adds a large amount to our commission check. You can always take these features off (if they're not contracted like the smartphone data plans) if you don't use them. Just know that most wireless carriers require features to be active for a certain amount of time or else the representative won't get the commission from it. Also, try to find a rep that is passionate. It might seem like common sense, but we can't tell you how many people just enter the store and mosey on over to any boring dope and expect greatness. Look for a rep that looks happy to be there. That rep will most likely be an upfront person and be detailed on equipment and plan pricing. If the rep is trained well enough, he or she will know about other carrier's pricing and plans as well, making this much easier on you. Ask the representative to be blunt and honest - telling your rep from the get-go to be straightforward and to-the-point will save both of you a lot of trouble. They'll get the job done faster and you'll get the info you're asking for without all the corporate mumbo-jumbo that they're supposed to shove in your head. Plus, if you don't already have a phone in mind, ask the representative what phone they use. If they're carrying it, it's most likely a decent phone. Most likely. Sales reps can usually budge on the equipment pricing, accessories, or waiving activation fees depending on whether you're at a corporate store or an indirect dealer. But something they can't do is budge on the plan pricing; that's something no one can adjust - only the retention department over the phone can. If you see a better price at another store or online, ask for a price match. This requires a print out of the ad that you saw, but you'd be surprised how many people don't care, or don't come prepared. Corporate stores can only price match in this fashion, too. Buying at a corporate store versus a 3rd party store (Costco, Sam's Club, Radio Shack) has its benefits such as better trained employees and usually original/more encompassing warranties. Don't threaten to leave your carrier if the representatives you're talking to don't give you a good deal. Sales reps know your contract length and they know you aren't going to pay that $200 ETF to get little Timmy off your plan and into an iPhone because they won't give you $50 off that dumbphone he wants. Things like telling them that you've been with them for 10+ years and you deserve 5 BlackBerry Bolds for free will only frustrate the poor guy. When it comes to equipment cost, the amount of years you've been with a carrier as a customer doesn't mean too much. Also don't say that you'll get a better deal by switching from x-carrier to y-carrier if you don't know for sure if it's exactly true. A good rep knows when a customer is lying and they'll pretty much be done trying to work with you at that point. Remember to play it smart. Don't try and ask for a smartphone without a data plan. That's like buying a brand new BMW and not wanting to put premium gas in it. The reps most likely can't make that happen due to restrictions with the way those plans work. Also never ask to speak to the manager while negotiating for a better deal. You're undermining the representative and are only going to annoy the manager. Upgrades (phone discounts you get when extending your current contract with your existing carrier) mean pretty little to the sales reps in terms of commission. The rep doesn't make much on these kinds of contracts and if you're going to give them a really hard time about pricing, they'll either pass you to another rep or put 0% effort into trying to help you out. • "I've had high maintenance customers bring a store employee coffee or thank you card after working really hard for them. Doing even the smallest things like that will get us to do pretty much anything you want in the future or fix any problem you might have down the road." • "Reps work on commission; it's how they pay their bills, feed their kids, and pretty much survive. It's really aggravating when you spend 45 minutes in the store talking to us about plans and pricing and then come back the next day to sign up with our co-worker on our day off." • "Reps are people too. We have our good and our bad days. Act like a decent human being and you'll be treated with the same respect." All in all, pretty standard stuff though like we said, you'd be surprised how many people don't really get the big picture. Hopefully this makes shopping for a new phone, wireless plan, and even carrier a little easier on you the next time around! 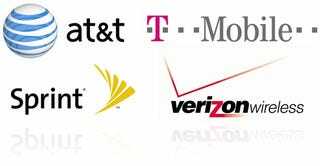 While this post tried to encompass all wireless carriers in the U.S., some have different policies and practices and it's best to visit their respective website to learn about plan/feature requirements, and any sales/rebates they have available before you go to the store.